The ability to have your phone in plain view while driving is great. Just make sure your phone is weatherproof if you plan to drive in the rain or mud. 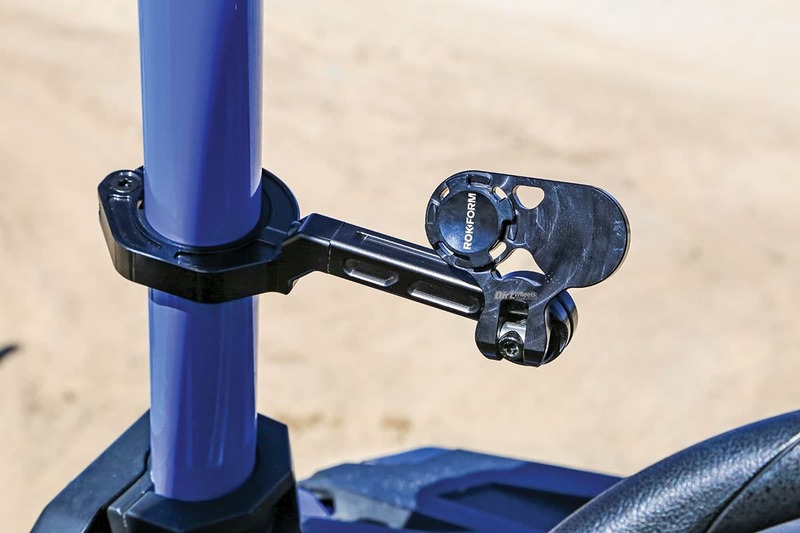 Installation of the Pro-Series UTV mount is simple. It has multiple adjustment points. An Allen wrench comes in the kit to aid this task. Rokform specializes in creating adventure cell phone cases for Apple and Samsung products. Their cases have magnetic bayonet-type sockets incorporated into the back, so the company has also designed multiple mounts to match. Their mounts attach your phone to bicycles, motorcycles, automobiles and now there is a sturdy UTV mount. We picked up a $49.99 Rugged case for an iPhone, along with Rokform’s all-new $199.99 Pro-Series UTV mount. This case is packed with helpful technology that protects your investment. The Rugged case can be dropped from up to 6 feet without causing damage to your expensive phone. The case exceeds a military drop test with the help of hard- and soft-shell construction. The Rugged case also has Rokform’s magnetic technology that utilizes a neodymium magnet in the case so you can stick your phone to Rokform mounts. The magnet won’t affect your GPS, credit cards, Wi-Fi or any other function on your phone. One thing to keep in mind is that magnets will burn out spin-disc hard drives on laptops if you set the phone directly over the hard drive; one of our editors is still bitter over that accident! There is also Rokform’s twist-lock system that allows an even more secure mount between the case and the mounts. Our staff have used Rokform cases on previous phones and never had phone failures, despite multiple slips and drops. We would suggest pairing it with Rokform’s tempered glass screen protector for an additional $29.99. This heavy-duty roll cage mount is CNC-machined out of aircraft-grade aluminum with stainless steel hardware. The clamp can fit around 1.75–2.0-inch roll cage tubes. The clamp utilizes rubber inserts that will protect your roll cage paint from getting scratched by the mount and subdue some vibration that would transfer to your phone. The mount has four points of adjustment to help drivers of different heights put their phone at the right viewing level. Rokform uses its twist-lock and magnet technology to secure your smartphone to the mount. It can withstand rough terrain without letting your phone get loose. The mount includes a lanyard that you can wrap around the mount and have attached to your phone, too. There are multiple GPS apps that you can download and utilize on your rides, and having your phone in view at all times is very helpful for that. These days, a lot of UTVs are outfitted with stereo systems that can answer calls and play your phone’s music via Bluetooth, so having your phone close makes controlling those functions easier. Locking your phone to the Pro-Series mount is simple, and it never came loose during the most aggressive driving. The only downside to think about is that a lot of phones aren’t water- or heavy weather-proof. So, if you have a phone that you don’t want to get covered in mud or hit hard by roost, then this might not be the best option for you. If you tend to lead on your rides or have a windshield, that would be very helpful. Overall, Rokform’s cases are worth every penny. Protect your phone, and enjoy clever mounting solutions. 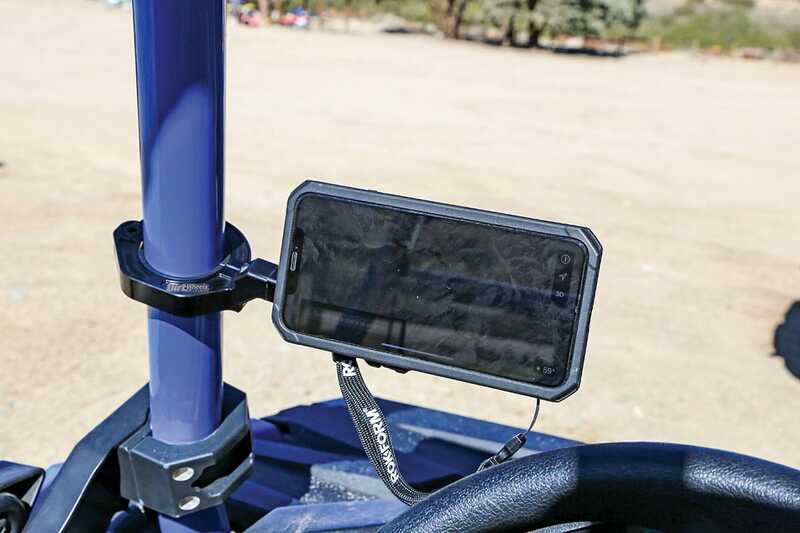 The Pro-Series UTV mount is well-made and very helpful in keeping your phone where you can view it and use it with ease. Go to www.rokform.com or call (855) 765-3676 for more info on Rokform products!